We don’t just build schools, we maintain and improve them. We have provided drinking water, helped to repair bridges and roads, and responded to both flood and drought. We are not a large charity. Support over time is necessary for success, and we have built and adopted all the schools we can support. Now we are expanding and improving them. Each year we fund improvements to buildings and grounds and improvements to the context of our schools: We fund wells, ponds, roads, fences, bridges, outdoor kitchens and gardens. 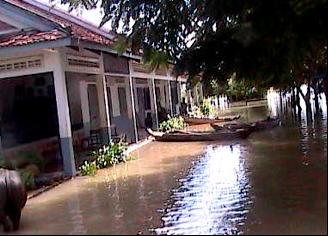 We give emergency support to school villages in times of flood and drought. 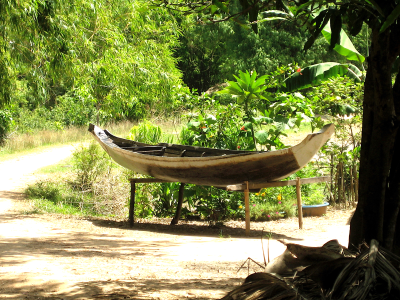 The main reason we can work so closely with these villages is Sarith. He began visiting schools in 1994, as soon as it was safe to travel after the Cambodian holocaust. Sarith began to buy school uniforms for the poorest kids, often the only clothes they had. Our project began as a group of his friends helped raise funds for school clothes to the poorest students. Here is a group from Tampoung village, being addressed on how we are going to fairly distribute bicycles. Gently led by Sarith, they decided the poorest kids living farthest from school would have priority. Here you see a little rough teasing, and perhaps a little lying, about who should go first. The development of our first school at River village (Poum Steung), became a model for developing the 7 additional schools in our project. 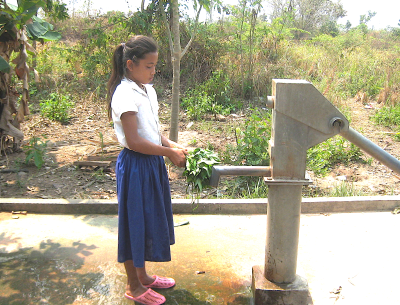 The first improvement at Poum Steung was a deep well to supply the school and village with clean water. Then we gave funds for volunteers to build an out-door kitchen so the moms could cook breakfast for the students. A few years later we funded a bridge volunteers wanted to build over the river running by the school. The nearest other crossing was 2 km. away. That bridge saved a long walk for students and parents living across the river. Then the village asked for help buying land next to the schoolyard. Our original playground had become completely shaded by the trees we had planted earlier, and we needed space for an organic garden and playing sports. 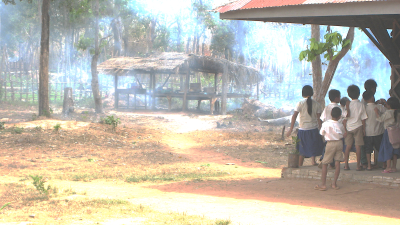 We each came up with half the cost ($1,500) and that land is now part of the school. 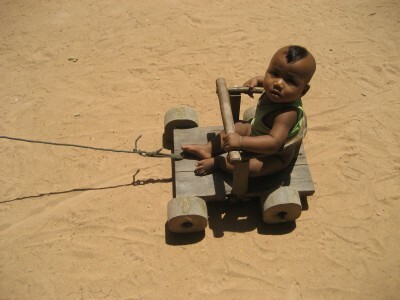 Here is a pre-kindergarten student, hair cut in a traditional way for his ethnic group, trying out his ride. 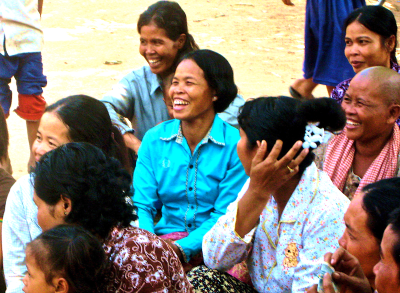 As we were improving and expanding Poum Steung, the principal there applied to an Australian Non Government Organization that builds libraries for schools. Thanks in part to the many improvements the village had made over the years, this NGO donated a beautiful new library filled with books. We have since donated funds for a new bathroom, new sand and gravel for the playground and new paint, this applied by teachers and volunteers. Poum Steung more recently got a teaching grant from yet another NGO. 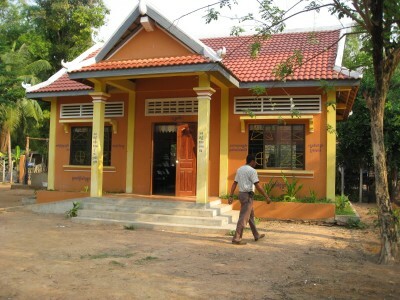 This funded two classroom buildings and hired English and computer teachers. The village asked for funds last year (2016) to repair these buildings and added a porch roof. The teachers they hired graduated from JHP Skola, our technical school in the nearby town. 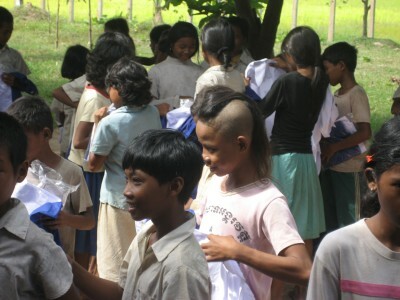 We still fund uniforms and school supplies annually. 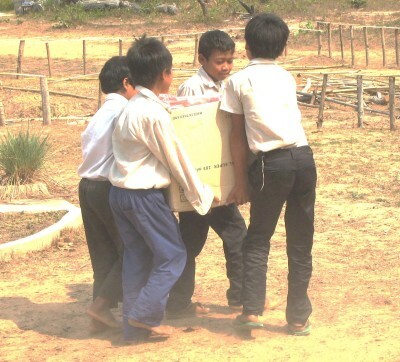 Here you see some of the boys helping unload the notebooks we purchased in town and brought out to the school. We also brought volley balls, jump ropes and badminton sets. Poum Steung has the most improvements and has been able to attract library and classroom funding because it is our oldest and has gotten support the longest. Statistics indicate that support over time improves outcome: Graduation rate here is over 95% (attendance alone was less than 50% when we built this school). Graduation from the next level (high school) is over 75% (it was well below half when we started). We attribute these improvements to our model of supporting the school and the community, and following rather than leading. We decide what to fund by meeting every year with teachers and the village mayor. We keep talking until we reach a consensus on what is most important and how much funding we have that year (usually a few hundred dollars per school). We want to support the school within its context. Improving the curriculum and modern methods of instruction would likely be helpful, but these are beyond our scope. The social context may not yet be ready for them. Bathrooms, kitchens, libraries, fences, ponds, classrooms, gardens and water come first, and we know we can do this. 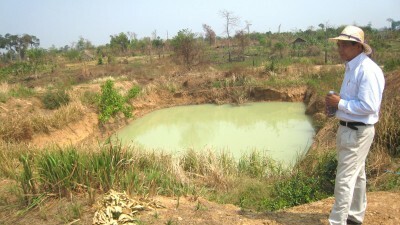 We paid contractors to dig ponds at 5 schools, every school that had no way to store water over the dry season (ponds are the local solution). We funded childproof fence wire and concrete posts around each pond, these constructed by parent volunteers. Here is Sarith at the Kouy pond. We funded outdoor kitchens at 4 schools, every school that needed one. 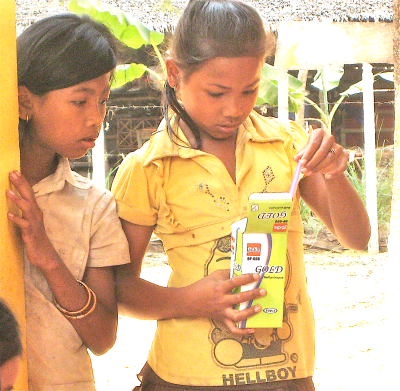 Other charities supply rice, dried fish and vegetables so children get sustenance at school. We supplied repaired used computers and printers to 4 schools so they can produce and file typed reports and communicate more quickly with their administrators. At Kok T’mei, a school we ‘adopted’ because it was near one of the schools we built, there were too many young children to fit in their classrooms. We supplied materials for walls and floor tile and parents built a 2-classroom addition next to the school. We have supplied water filters (from another NGO) at three schools and will supply more as needed. All well water has been tested for safety. 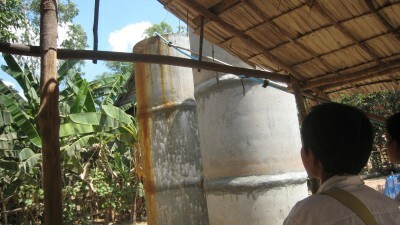 Here you see a water storage system at the well in Tampoung. We funded paint and brushes, and volunteers have re-painted 3 schools. We painted our technical school in and out. Classrooms, dorms. kitchen and dining room floors are tiled. We have put in a pond and are eating fish, and our chickens are laying eggs. The organic garden is filled with vegetables. Now we grow our own fish at JHP, and our students no longer have to try to catch them. We bought dirt fill and gravel to repair the washed out road through Tampoung. The village volunteers filled the potholes and leveled the new road. 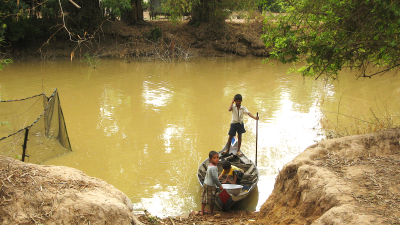 In the flooding of 2011, 245 Poum Steung families lived under tarps on the roads, the only land above water. We gave food rice and once the water went down, rice for seed. In the drought of 2016, with the assistance of another NGO, we dug our well deeper and ran a line to our fence so the village near our technical school had water for drinking. We are indeed a school project, but in order to do a good job of that, we also are a water project, a garden project, a fence project and a community support in general project. As we strengthen the social context, we strengthen our school and strengthen our students. Thank you very much to all of you who have so generously supported us.